Santiago Reta is showing me around Finca La Escarcha, his 30-hectare vineyard in Tupungato, Uco Valley. In the distance, he gesticulates, is snow-capped Tupungato volcano, though she’s being particularly coy today, hidden behind clouds. Santiago Reta from Finca La Escarcha. Working in wine exports for many years at Familia Zuccardi and Bodega Lagarde, Santiago snapped up this piece of land in 2004. Now dedicated fulltime to his vines, this is very much a boutique project that started off releasing 4,800 bottles in 2011, doubling up production for the first time in 2016. It’s a far cry from his days in sales exports. With just six varietals planted at Finca La Escarcha, Santiago sells much of it on, keeping back Viognier, Syrah and Malbec for Entrelíneas, a line whose varietals hint that this vineyard is a miniature Argentine answer to Rhône (excluding Malbec, of course). And, working with Italian oenologist Giuseppe Franceschini, a whites master from Bodega Caelum, the 2014 Viognier is truly a white delight. Despite the star technical talent behind the bottles, this is a garagiste project. Kicking off with reds in 2010 and whites in 2011, producing on site by 2015, Santiago says: “The winery is basically a garage!” But it’s an elegant, well-thought out one, given that the sharp eye of his architect wife Carolina was involved. 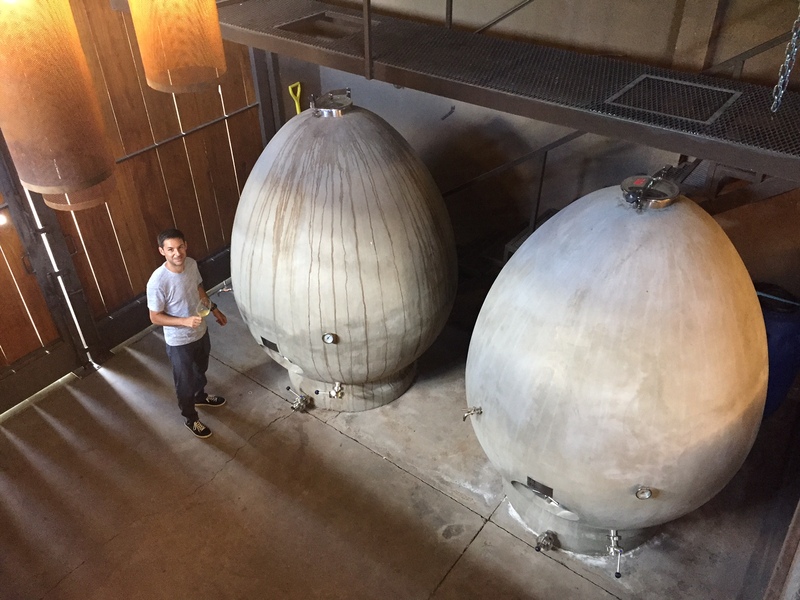 Housing two 3,000-litre capacity concrete eggs and two stainless steel tanks as well as a small barrel room, there’s enough space for Santiago to fulfil his 10,000-bottle wine-producing needs. In this pocket of Uco Valley, Santiago will once again boost his Little Rhône portfolio this year with a second edition of Viognier-Roussanne, a white blend that also has southern France origins. “Although I’m planning to graft some Roussanne into the vineyard next spring, I’ll buy some grapes from my cousin so I can make this blend again this year.” And, given that sandy soil gives way to volcanic rocks (thank you Tupungato) some 1.5 metres below the surface, his wines have a mineral line running through them. The ever-present breeze has stopped; of course it has, it’s almost lunchtime. And the good news is that as soon as he releases the 2016 Viognier, Santiago can undertake a vertical tasting of this Rhône-style white dating back to 2011 for the first time. Producing 1,260 bottles of the 2016, this white is floral, citrus and tropical with a little chamomile. In the mouth, however, acidity is marked, with plenty of lemon pith and chamomile. While Santiago didn’t make a 2015 as he was busy constructing the winery, the 2014 Viognier is robust and buttery thanks to its fermentation in French oak followed up by 11 months in barrels. Tropical notes are firm; banana, cloves and marzipan also pop up. And of course, medium-high acidity keeps all these creamy tones in check. Refreshing proof that Argentina can make creative whites at a reasonable price.